With every purchase we make, we are given a choice. Not only about what we want to put on or in our body, but who and what we want to support. “Organic” is not just some fancy buzz word that will be out of style in a decade. It’s here to stay because, we feel, it’s how things should be—organic and just as pure as nature intended. We use organically grown ingredients in all our products, from farmers that use little to no pesticides and natural fertilizers to produce them. Growing organics and using them for our skin care is one of the most proactive ways for us to coexist with the environment, create a thriving ecosystem for all creatures, and make your skin look beautiful—all at the same time. There are times when we don’t use certified organic ingredients, but in these cases, this is either because we have found a source that is grown organically but uncertified, or the ingredient has been wildcrafted. A selection of the herbs used in our line are hand picked in the mountains where they grow wild — this is the definition of wildcrafted. When we use wildcrafted herbs, we know that no commercial farming methods have been used, and that the plants are hearty, vibrant and full of skin-nourishing nutrients. 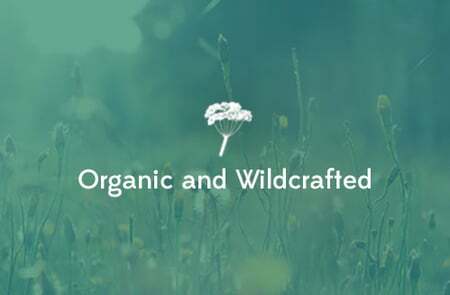 Wildcrafted herbs cannot be labeled organic, but they are in essence the most organically grown ingredients we use. Additionally, if we use water in our products, we use natural spring water directly from the source, which also cannot be labeled organic. We also gladly use ingredients that are grown organically, but not labeled “organic,” because these are grown by people who care. Large, commercial farms with organic certification can often time use amounts of chemicals and pesticides throughout the growing process while maintaining their label. We don’t care about the label, we just want good ingredients! It’s tricky for products that contain wildcrafted ingredients to be labeled organic because the standards don’t accommodate real herbs from nature. We agree—it’s silly, but true. If we were to make sure all ingredients in our products were certified organic, the quality of our products would be compromised. Generally a non-certified ingredient that is grown by a conscious farmer who uses organic practices will be of higher quality than a certified ingredient from a large-scale organic grower. We don’t want to pay money to a certifying board that allows other companies to market lesser products under the guise of “organic.” Just because it’s organic doesn’t mean it works, is healthy, or will make your skin glow like it never has before. Essentially, we as purveyors of the highest quality skin care products on the market, don’t feel we need to let loose guidelines determine what is good enough for our line. We want the best, so we go out and find it. Finally, we choose every ingredient specifically and consciously, taking into account aspects beyond just organics. We look at sustainability, labor conditions, and geographic location of the ingredients we source. We tend to think we have the best of all worlds: the best ingredients, the best products and the best results, all of which comes from our ability to tap into the wisdom of nature while also looking at a larger picture of re-establishing our responsibility to our earth. If you have any questions about our ingredients and products, please feel free to send us a line to chat! Thank you so much for creating a product that is the embodiment of.. liquid love. I just tried the mud mask, herbal cleanser and citrus moisturizing oil and I feel like I’m glowing. I stopped using all forms of soap and cleansers on my face about 4 years ago and vowed never to use products again. But secretly, I missed the feeling of clean, nice smelling skin. The fact that your products don’t mess with the natural acid mantle of the face is the reason I tried your samples. Your passion for producing pure (almost magical) and naturally fragrant products is the reason I’ll purchase again.